by Niklas Törneke Author · Steven C. Hayes Author of introduction, etc. The use of metaphor is central to the implementation of acceptance and commitment therapy (ACT) and dialectical behavior therapy (DBT), and is a powerful tool for all practicing psychotherapists. 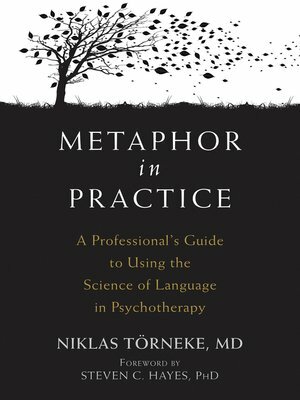 In Metaphor in Practice, psychotherapist Niklas Törneke presents the first practical book to combine the behavioral and linguistic sciences of metaphor, and illustrates how and when to apply metaphors in practice for better treatment outcomes. The use of metaphors and experiential exercises can help clients gain a deeper understanding of the problems that cause their disorders. Metaphors help clients connect with their values, and often spark the inspiration and motivation needed to make a commitment to change. And while metaphor is central to relational frame theory (RFT), acceptance and commitment therapy (ACT), and dialectical behavior therapy (DBT), research now shows its usefulness has an even broader reach. In this book, you'll find a scientific analysis of metaphor based on over thirty years of research, as well as trends in research over the last ten years. The book includes an overview of RFT, how metaphor has influenced the community of behavior analysis, as well as available clinical research on metaphor use. You'll also discover how to create metaphors for functional analysis, distance of observation, and things that matter to your client. Most importantly, you'll find practical examples of metaphors and clinical exercises you can use in-session. There are many books on metaphor and psychotherapy, but this is the first book to make the connection between the science of metaphor and the detailed clinical process of using that knowledge. If you are a mental health professional—or simply interested in the science of metaphor—this book will provide everything you need to understand and apply this approach.